IR Rays are invisible to human eye, so it is very difficult to check the working of IR LED. Usually we use a Mobile camera to test IR LED since the pink light from the IR LED becomes visible in digital camera. 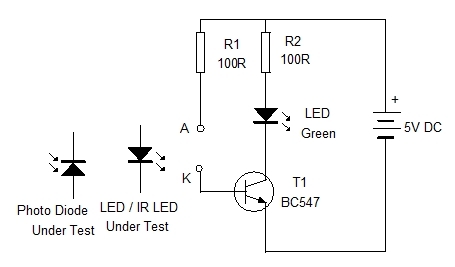 We can make a simple IR LED tester so that, before using it in the project, we can confirm whether it is good or not. Lot of IR LEDs are also in our Junk box. So we can check all IR LEDs and discard the damaged ones. The same tester can be used to check all ordinary LEDs, Photo diodes, Silicon and Germanium diodes etc.